long 5 Feet length ', weight 70 ~ 140 lbs. It's portable. Light weight and small. 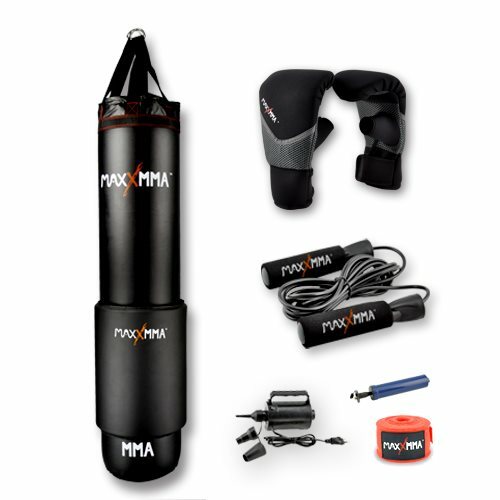 The "MaxxMMA SOFTSTRIKE™" technology combined with the bags inherent "Give Effect ™"makes it the only heavy bag of its kind on the market! It's just like punching a real person and not just a stiff sack of gravel. The air and water bladders within the bag buckle just like your opponent will when they feel your fury! It's truly a "real feel" heavy bag! The bag always retains its shape and form, no need to repair tears with duct tape or having to roll it around to get the shape back like traditional heavy bags. It's headache free! 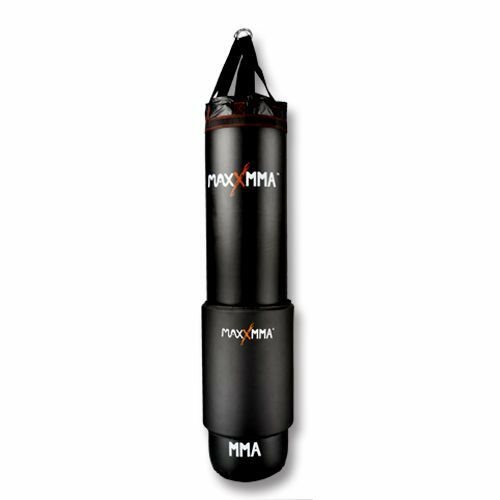 When mounted, this unique heavy bag is extremely stable and can take repeated punches without swaying. When heavy bags sway into a puncher's fist, injuries can occur much more easily. So durable, it comes with a 10 year guarantee on the inner-tube! Robot Test Boxing is a strenuous and exhaustive sport. Durablility test by humans usally takes a long time. So we developed tireless robots copying human punches over 300lbs to continuously test our products. 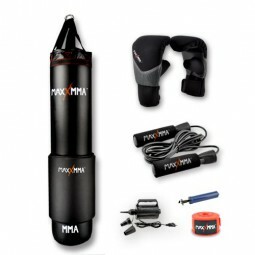 Check out what some of our coaches and users are saying about our Ex Long Water/Air Heavy bag! • Size: 13"(Dia.) * 60"
• Color Box: 22" x 16.25" x 8.25"
Adjust weight with Water/Air ratio. Note: DO NOT release too much air from the air section at one time, as it will make the bag overweight. Adjust hardness of the bag. Inflate the WATER SECTION with the hand pump and the air needle into air-needle-valve to adjust the bag to your preferred hardness. It is suggested that the bag buckles to some extent with each punch. We call this “Give Effect” and it is an effective deterrent to hand, wrist and elbow injuries. Step1- Unfold the bag, lay it flat on the floor and open the valve of the air section Step 2-Install the electric pump Step 3-Attach the sharp-pointed nozzle to the "INFLATE" port of the electric pump and insert tightly into the air valve of the air section to inflate the bladder. Step 4-During the inflation process, slowly lift the whole bag up straight and slightly shake the shell to ensure that the bottom of the bladder fit the shell. Step 5-Hold the bladder Step 6-Lift the shell to ensure the inner-tube slide into the bottom of the shell. Step 7-Remove the air-needle-valve, install hand pump Step 8-Some of the air pressures may have got lost when you insert back the air-stop. Use the hand pump with air needle inserted to the air-needle-valve Step 9-Add more air into the bladder and keep it in a FULL condition. Step 10-Keep the bag upright before the assembly is finished. Remove the water cap and rubber plug of the water-valve Step11-Loosen your showerhead Step 11-Plug the hose to a faucet with the white rubber connector or the garden hose adapter and fill the water section with water. Step 12- Fill water into the water bag Step 13-After about 20 seconds, turn off the water and lift the shell to ensure the inner-tube slide into the bottom of the shell. Step 14-Turn off the water and remove the hose. Replace the rubber plug and the cap. MaxxMMA shall not have any liability to repair and/or replace the said equipment or part if the purchaser uses the equipment or part in contravention of the instructions provided by MaxxMMA, or if the damage is caused by the purchaser in any way. In no event shall MaxxMMA's liability for any reason and upon any cause of action whatsoever exceed the value of the product purchased. Misuse, abuse, improper use or failure to follow instructions including any disclaimer shall void any liability, responsibility or warranty by MaxxMMA.